In this post, we will show you how to create pathlines thanks to the Pathlines visual model. Pathlines are visual models which represent the trajectory of the center of mass of selected atoms along selected Paths. Pathlines may be used to understand the motion of a single atom, or a group of atoms, along a Path. Before starting the tutorial, please, download this archive: Pathlines (~13MB). 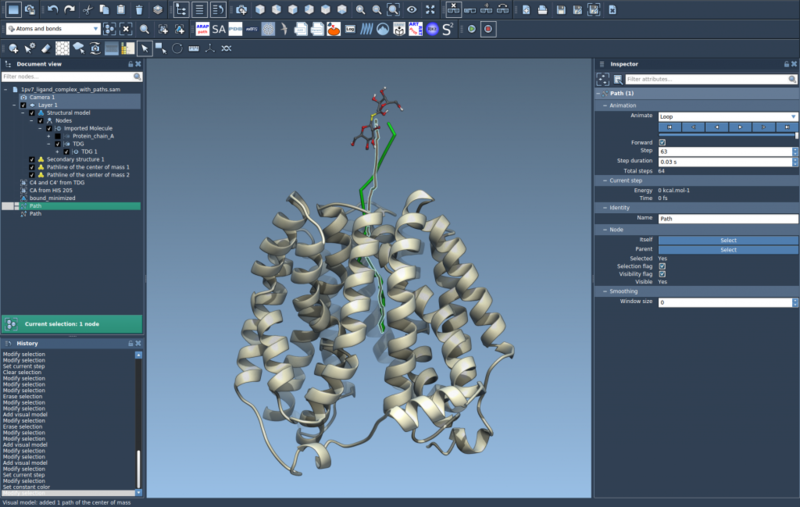 It contains a file (1pv7_ligand_complex_with_paths.sam) from the Ligand unbinding pathway search tutorial with already computed Paths. To create pathlines, select in the Document view a group of atoms for which you want to visualize the motion of their center of mass and select one or more Paths (to select more than one node use the Ctrl / Cmd key). If no Path is chosen, all the Paths from the active Document will be used. If no atoms are selected, all atoms from the active Document will be used. 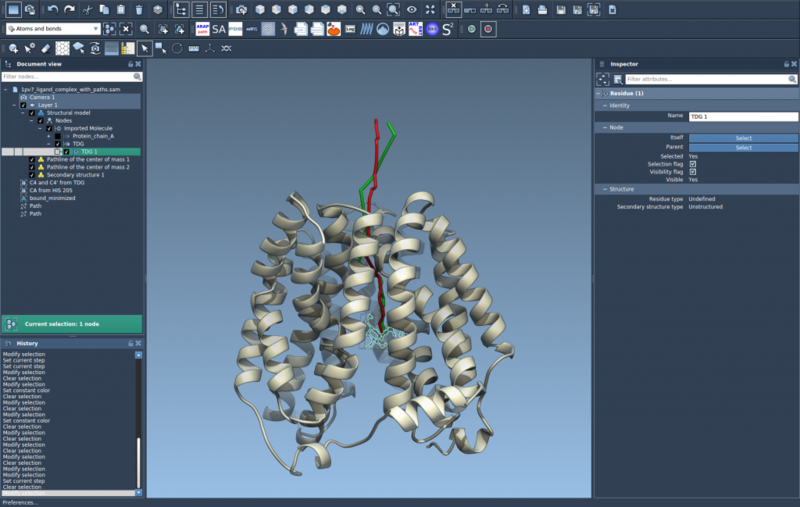 Select the ligand named TDG and one of the Paths. 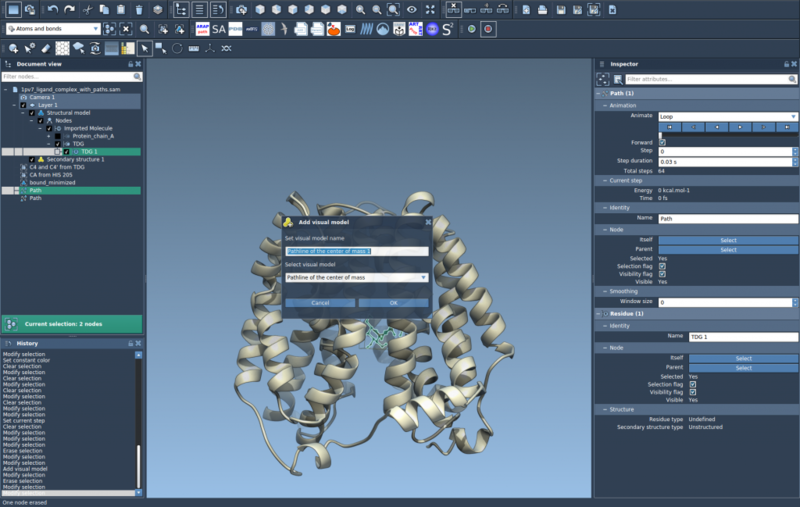 Go to Visualization / Add visual model or use the Shift + Ctrl + V shortcut to create a Visual Model. In the pop-up window, choose “Pathline of the center of mass” and press Ok. The new pathline will show how the center of mass of the TDG ligand moves alongside the chosen Path. You can do the same for the second Path. 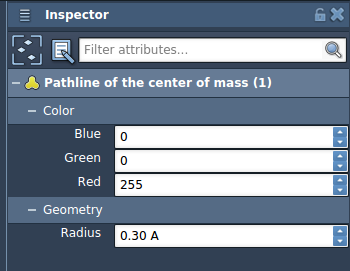 You can modify the thickness and color of a pathline in the Inspector by selecting a pathline. Note: If you delete a Path, the corresponding pathline will be deleted too; if you delete some of the atoms for which a pathline was created, the pathline will be modified. Now that you know how to visualize paths, you might want to use the P-NEB app to optimize them.